In the midst of love, there was a tale of a modern prefab house! They have traffic up north, too! "Do you, uhm, have something to do with prefab houses?" "When I'm not chasing my Kenyan brother (which is very hard to do by the way, do you know how fast Kenyans run?)... YES!" "WE BUILT YOUR DOGTROT MOD MODERN PREFAB IN THE NORTHEAST!!!!" And thus I met the awesome builders of The Dogtrot Mod, of State College Design and Construction. 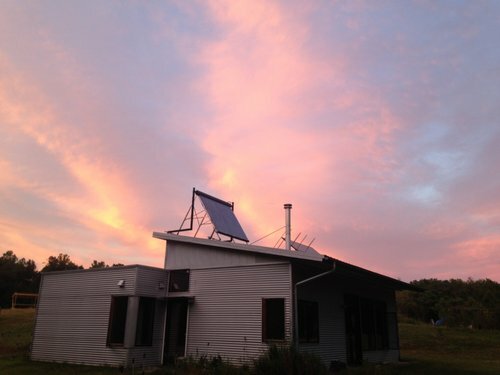 We jabbered on and on about the prefab house project in the northeast, and all the cool things the client did. So you still want to know how this southern girl is Kenyan? Well let me tell you a story, of generations of friendship between the Keinos and we. Oh nevermind that will take too long. Ok nevermind, that's too long, too. With the beautiful bride and the groom's older brother. There was solar EVERYWHERE, and the Amish here use it not just to recharge tractor batteries. 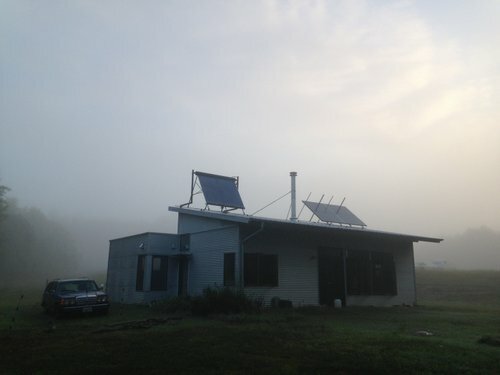 Solar panels on the right, solar hot water on left. Not just the entire roof but the yard, too! I'm not going to say we'll never add more solar to our prefab house, but it IS amazing when you compare how minimal our own systems are vs. houses on "solar"- are they living lightly at all? And: WOW we really like the way we live, it shows how you can learn to live with so much less and barely notice it! For ourselves, the only time we notice it is when, once a year, we get about three weeks of cloud cover. But otherwise we don't even think about the fact that we live so fully on four measly solar panels, ha! We braked for history and science, often intertwined. Handsome Husband made us stop for every single historical marker it seemed. But it was all good. Port Royal, VA was an interesting stop because it made you think what a shame it is so many other small towns falling into disrepair (and worse, disappearing) don't have someone with vision like they do in Port Royal to recognize the value in restoring vs. razing these structures. With only 126 people in the town, Port Royal sure has a lot of doers. And then, exhausted but with hearts overflowing, we were back on the bay.